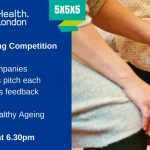 For all innovators seeking to refine your pitching skills, DigitalHealth.London have joined forces with Health Foundry to give you 5x5x5 Pitches. Anybody can sign up to pitch at the monthly sessions, with each event providing five innovators with five minutes each to pitch to an audience of peers, clinicians, investors and policy makers. Pitches are followed by five minutes of feedback from the audience, providing a chance for you to really get down to the nitty gritty of your digital health business or idea. It’s honest, constructive feedback on how to tell your story; from the people that matter.